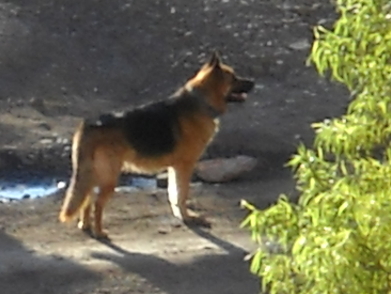 As many of you know, Poochito is the beautiful German Shepard that lives next door at the construction site. He is ostensibly their "guard dog." However, Poochito is really a lover, not a fighter. We do hear him bark sometimes during the night, but we think that is more out of boredom than anything else. Here is Poochito looking all majestic, proud and guarddoggy-like. What a beautiful boy he is. Over the last year, since Poochito came to the construction site, I have tried my best to befriend him. But, he is absolutely terrified of me. Our empirical observations would indicate that I am the only person, or thing, on the planet that frightens him. (And I loooove him so.) This dog has no fear of anyone else, no fear of heavy construction equipment, no fear of heights (he goes up to the third or fourth floor of the open construction and goes right over to the edge and looks out over his domain), no fear of sudden, loud noises, NADA. No fear of anything, but me!! When he sees me, he runs as fast as he can to the comfort of his enclosed construction site. He's not afraid of women in general. Other women come to the construction site and he doesn't run from them. He's not afraid of Gringos. He let Gil pet him once (we were standing and talking to the construction site owner), but he would not come near me even to take a dog biscuit. After he let Gil pet him, I took one step toward him and he ran for the hills and hid behind one of the construction guys way inside of the construction site. Now, this really bugs me, because Gil could care less about petting Poochito, but I love him and really want to pet him. Gil enjoys watching Poochito and his antics, but, he isn't a dog person like I am, so he can give or take a Poochito petting. Now, it's important that I point out that I have never done anything to harm Poochito. He was terrified of me the very first time he laid eyes on me. Gil thinks it's because I actually pay him some attention, while most of the rest of the human world seems to be rather indifferent to him. He greets his workers every morning with wags and wiggles, and they pretty much ignore him. I acknowledge his existence, so he thinks there must be something sinister going on there. Anyway, that's Gil's theory. Anyway, in an attempt to get Poochito to see me as a benefit delivery system rather than the diabla blanca from the black lagoon he apparently thinks I am, I keep 5 or 6 dog biscuits with me in a baggy in my coat pocket at all times, just in case I will be passing within his realm. In the last couple of weeks, I have been able to get him to take them out of my hand, but only after having thrown a couple to him first from a distance. But, he will not let me pet him. If I reach for him without a biscuit in my hand, no matter how gingerly or non-threateningly, he runs away. Anyway, today, we had a breakthrough -- although I have no delusions that it is going to stick. I'm sure that the next time he sees me, he is going to run like the dickens to get away from me, and I'm going to have to go into the "throw-a-couple-of-biscuits-until-he-will-finally-approach-and-take-one-out-of-my-hand" routine all over again. Nervously taking a biscuit from my hand. The back-off. Nerves got the better of him. Finally, he let me pet him. But you can see he's not too thrilled about it. "I'm not liking this, but there are biscuits left in that bag." "Okay, scary lady, this is really not fun. Please don't hurt me. Oh, god, this is so scary." Right after that last picture, he ran back away from me. Not too far, (I had a couple of biscuits left), but he did not approach again. He watched as I petted Paco, the dog at the Vega store next door. But, he'd had his fill of petting and was probably thinking that Paco is loco for letting me get so close to him. Poochito is a really beautiful dog. But truthfully, he's much more majestic from a distance because from a distance you CANNOT SEE THE FEAR ON HIS FACE!!!!! Okay, and then there is Paco. He loves and craves attention. He'd rather get petted than have a biscuit to eat. Just a biscuit is not enough. He wants lots and lots of petting. Paco. See the uneaten biscuit? Paco says, "Who cares about biscuits, come pet me." "Yes, yes. That's what I like." There's a lesson to be learned here, Poochito. Haven't seen hide nor hair of him today. He's probably hiding out for fear the diabla blanca will show up again :). He wants those biscuits, but he sure wishes they'd come from somewhere else. One day, Gil was tossing some to him from our balcony. He never looked up so he didn't know where they were coming from. Just thought they were manna from heaven. I'm sure he prefers that rather than having to take them from my hand. Congratulations, Deborah, you've finally scored. Nevertheless, isn't it enough for you just to have Gil following you around in ecstatic worship?